The circumference measurements given are unstretched. This is a very stretchy hat. c4b = cable 4 back – Slip the next 2 stitches onto cable needle and hold in back of work. Knit the next 2 stitches from left-hand needle, knit the 2 stitches from the cable needle. The c2b can be made without a cable needle. There are several methods for doing that. I have a video of my method. 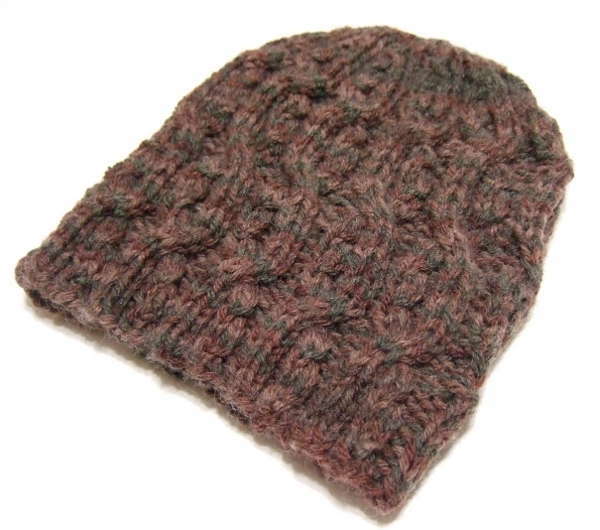 Repeat rnds 3-26 until hat measures 2 inches less than desired finished length. Begin crown after a rnd 4 or a rnd 16. Absolutely stunning.. Thank you for sharing the pattern, will most certainly give it a go..
Can this pattern be done on circular needles? All but the crown. The crown will eventually get to small for circulars so will either need to be split with a seam, or using a method for small in-the-round knitting. hi i love your patterns, ive only knitted on 2 straight needles and dont get on with circular. can i use this pattern for 2 needles? Is this beautiful hat a beanie style or a slouch style? that isnt a very big head? That is the non-stretched measurement of the finished hat. Cabled hats pull in considerably but are very stretchy.